The devil nut, also known as bat nut, goat head, bull nut is the seed pod of Trapa bicornis, an aquatic Asian plant. Depending who you ask, this natural biological curio may look like a goat-horned devil, a bull or buffalo, a flying bat, etc. 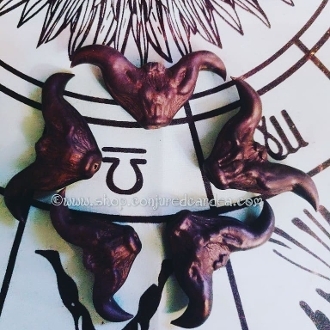 It would be perfect for those altars or mojos dedicated to tricksters such as Eshu-Elegua-Legba of West Africa, Hades-Pluto of the ancient Mediterranean, or Loki of the Norse. It could be used to represent baphomet on the altar as well. This pod is often used to ward off evil, and for that purpose it can be placed above a doorway, facing outward as a guardian, much in the manner of ancient Tibetan door demons. It works wonder in mojo bags for breaking jinxes, hexes, crossings, or for protection in general. Carry this pod in a black bag anointed with my De'croiser, Protection 5, Fiery Wall of Protection, Exorcism, or Fear not to Walk Over Evil oil. You will receive ONE pod from the picture.